Light citrus fragrance. Cleans and freshens all hard surfaces. Safe to use on all water washable surfaces. 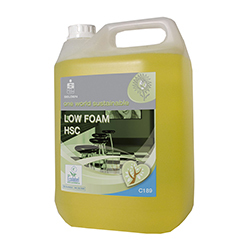 Low foaming Eco-friendly formulation, ideal for scrubber dryers. For the regular cleaning of floors, walls, work surfaces and all non-porous surfaces in hotels, sports complexes, conference centres, offices, institutions etc.